There was much laughter during the Residential Holiday. The week started off with a day’s painting, followed by a trip out the next day for those who wished to and this rhythm continued throughout the week. 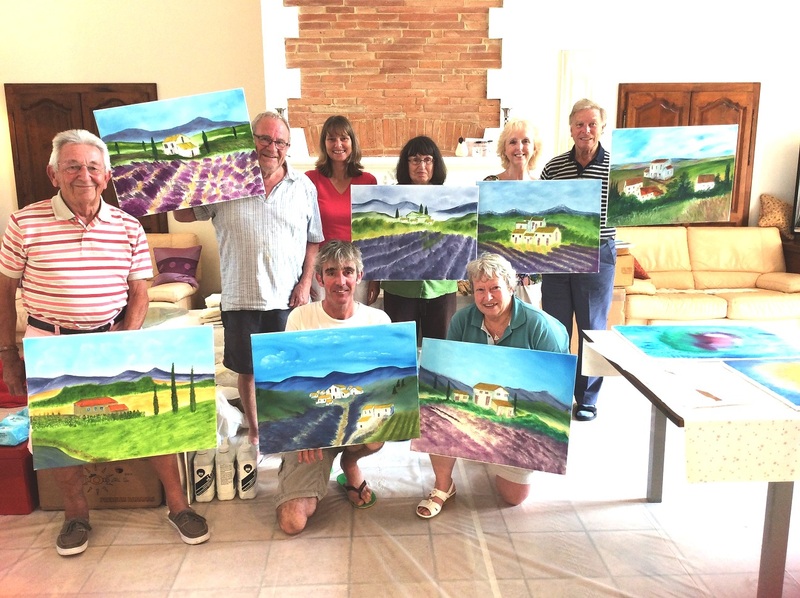 Although we went through each painting step-by-step, as the week progressed people were encouraged to develop more their own style so that by day three, we had canvasses ranging from fields of lavender to rows of vineyards. This peaked on the final day with anything from abstract impressions to nebulas to a middle eastern city. During days off, vineyards were investigated, chateaux explored and picnics were eaten by sparkling rivers. We all returned to the UK, happy, tanned and full on the culinary delights that France had to offer, each of us with a set of completed canvasses. Special thanks to Janine and Alistair who made our stay so welcome at their villa. The itinerary for next year’s trip is being organised as I write and will be due out the next few weeks.